You can have the best of both worlds at Alsagra. 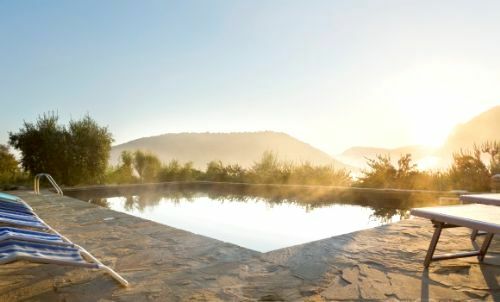 Mums and dads can take a deep breath of warm, olive grove-scented air and relax with a glass of local wine as the sun sets with a golden glow over the stunning hill villages of Tuscany. Meanwhile, children of all ages can do their own thing, distracted by two fully-equipped play areas,wooden gypsy caravan with dressing up clothes, table tennis, table football and oodles of toys, while being kept safe by child-proof door gates in each apartment and fences around the stunning solar-heated pool and unique toddler pool. 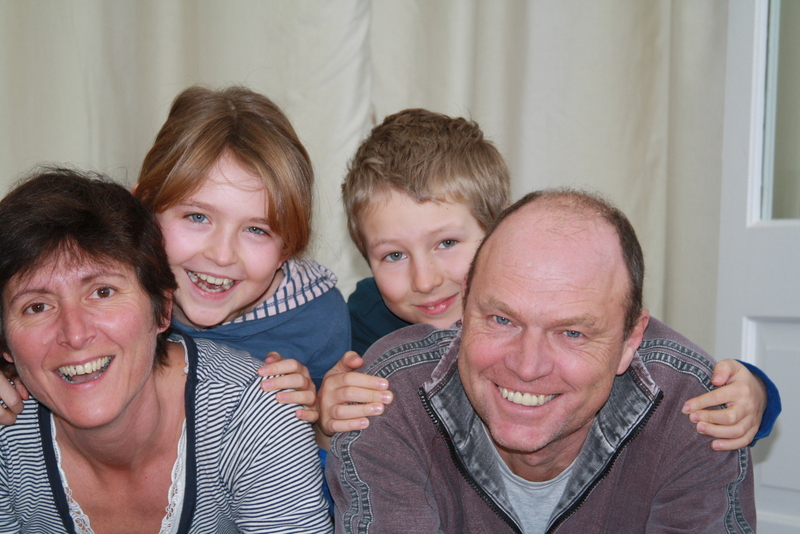 Owners Stephen and Helen live close by with their children, so they know exactly what parents with children in tow need to kick back and enjoy a holiday. 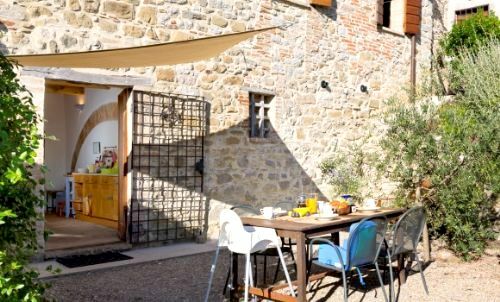 It shows in the way in which they have lovingly restored their fabulous traditional Umbrian stone farmhouse, set in two acres of terraced olive groves, gardens and Chestnut and Oak woodlands, with family needs firmly in mind. The house itself sits on hill on the border between Tuscany and Umbria, overlooking the pretty village of San Giovanni Del Pantano and with incredible views towards Assisi, Magione and Perugia. 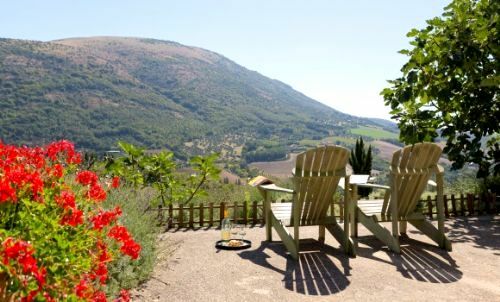 It is divided into three independent self-catering apartments, each with high-beamed wooden ceilings, terracotta tiled flooring and windows staring dreamily out over the valley below. Each apartment has a living area with comfortable sofas, a CD/radio system, free WiFi, and central heating for out-of-season visitors. Kitchens have all mod-cons; fridge freezer, microwave, kettle, toaster, hob and oven with grill but a warm traditional colour palette and hand-made wooden surfaces give the whole place a wonderful warm Italian rustic feel. No need to worry about privacy either. Once you've had enough socialising with your chilled-out fellow trippers around the pool, you can retire to your secluded private patio, complete with BBQ, chairs and loungers. L'Alba - Guests enter the apartment via an authentic Umbrian style, external stone staircase onto one of their two private patio areas, the first is just outside the kitchen and has a well positioned dining area- ideal for breakfast, with a view of the valley, so perfect it seems more like photograph. Inside there is an open plan living area with fully equipped kitchen with handmade wooden work tops, a spacious living room and a dining area which is often neglected in the summer months but is a nice spot of entertaining during winter and is kept warm by the apartment's central heating. The bedrooms and bathroom are accessed through the living area, there is one large double with a romantic cast iron bed and views across the rolling hills, plus a twin bedroom ideal for little ones with a pretty set of single beds ( can be made into double also) with space for a cot if required. There is a family bathroom with shower. The second patio area is a lovely suntrap with Pergola, BBQ, sun loungers and dining furniture. Holidays, as all parents know, can be a logistical nightmare as they struggle to pack everything the younger members of the family are likely to need for a week or two away. Alsagra owners Stephen and Helen have gone a long way to removing most of the worry surrounding pre-trip preparation. Apartments come with safety gates, high chairs, baby monitors, children's steps, bottle sterilisers, bed guards, even prams and buggies. There are toys, games, books and DVDs for all ages, and play areas stuffed with swings, slides, climbing frames and peddle cars. The zip wire and wooden gypsy caravan with tons of dressing up clothes will keep the children amused for hours. Baby packs are available on request and a baby-sitting service is on tap too. Helen or a trusted and experienced childminder from the village will keep an eye on your sleeping little ones, child minding is available on request so that you can go out for the day and relax knowing your children are being well looked after. . The table tennis and table football are great additions for the bigger kids and are great for a family competition. A high point for bigger boys and girls (and often their parents) is the weekly pizza evening when everyone gathers to custom-make the pizza of their choice from fresh local ingredients before cooking it in an outdoor wood-fired oven. It's a great chance to meet your fellow guests over a glass of wine. sleeps 4 in 2 large bedrooms, 1 double and 1 twin. Cots can be added as required. The apartments are within 2.5hrs of Pisa, Bologna and Rome airports. Lake Trasimeno with beach like shore is 30 minutes drive away, with on beach café and bar. There are local restaurants within a 5 minute drive. On one of the olive terraces there is a wonderful fenced and solar heated swimming pool and separate heated toddler pool which are both shared only by the 3 apartments onsite. Babysitting/childminder services available on request at additional cost. Occasionally a kids club is available with sufficient attendees. There is plenty of baby equipment available incl. Cots (1 wooden, 3 travel), booster seats, bed guards, potties, sterliser, baby monitor, plastic cutlery, plates and cups, baby bibs, plastic steps, baby rocker, bed guards, pushchair, changing mat. There's a selection of toys, books and games for all ages. Art classes are also available request. 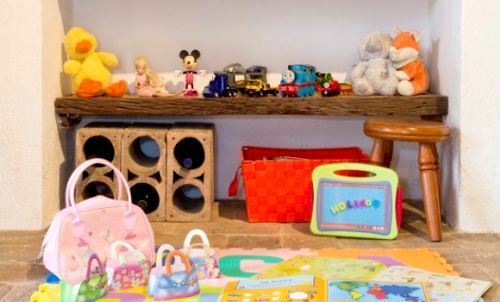 The owners are happy to do a pre arrival shop for guests, so whether it is nappies, cotton wool, wipes, soaps, baby milk etc ask and they can attempt to provide. There is an option for meals either on arrival or during you stay, with menus for both adults and children, plus there is a sociable pizza making evening in which parents get a chance to meet the other guests whilst the little ones make traditional pizzas to be baked in a outdoor wood burning oven. Cookery classes available on request. Outside little ones will love the large wooden train, climbing frames, swing sets, trikes, ride ons and for slightly older children the football nets. Horse riding can also be arranged on request. Massage and spa treatments available on request. The cottage has two private patio dining areas, one in the logia outside the kitchen with breathtaking panoramic views of the valley making for a pleasurable dining experience. The other area has a Pergola, barbeque, table, chairs and loungers. 90% of cleaning products used are eco friendly, solar power is used for pool heating, all light bulbs are low energy. All rubbish is and must be recycled in the local rubbish bins.